Gas sampling equipment is one of the most widely used tools in food processing, brewing and landfill gas (LFG) monitoring applications. Units range from gas extraction meters, gas analyzers, and carbon dioxide (CO2) analyzers, to nitrous oxide (N2O) and carbon monoxide (CO) analyzers. Proper equipment calibration is essential to ensure sample accuracy and equipment reliability, reduce equipment downtime, and eliminate safety risks. If gas analyzer units detect methane above recommended threshold levels, technicians know they need to adjust the wells to regulate the methane by opening up the wells or making other adjustments to tune the well. 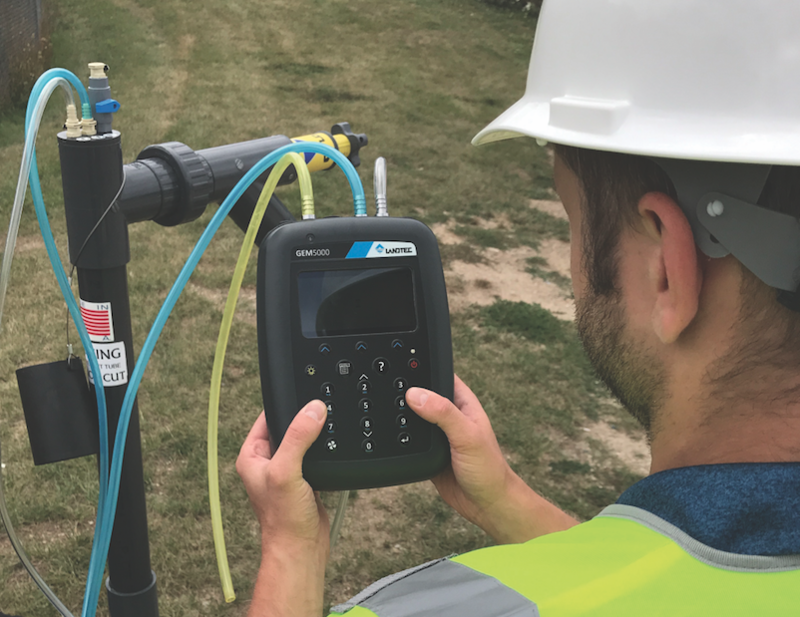 Since government agencies regulate LFG emissions gas, analyzer equipment accuracy plays a big part in maintaining landfill compliance. Equipment should be calibrated at least annually; in some cases, bi-annual calibration is recommended. A rigorous calibration process should include a robust quality assurance/quality control process filled with manual and automated checks to verify the calibration was done precisely. When repairs are necessary, expert technicians should seek the root cause to correctly repair and service the instrument. Make sure the calibration laboratory is fully certified to ISO/IEC 17025:2005 requirements for carrying out calibrations. For example, when QED receives one of its LANDTEC analyzers for calibration and/or repair at its calibration laboratory in Dexter, Mich., the unit is typically placed in a calibration chamber, and goes through an automated programming process. First, the process verifies the type of analyzer and exactly what is needed to calibrate the specific model. Next, it will perform several pre-calibration tests of the equipment. Then the analyzers are purged with gas to obtain a baseline reading and reach a stabilization period before the actual gas calibration process beings. The gas calibration technician pushes a highly graded research gas through the analyzer at all ranges needed by each model to make sure each one reads within the specifications. The gases used, special mixtures contained in high-pressure compressed gas metal cylinders, should be certified by the National Institute of Standards and Technology (NIST). For example, for Environmental Protection Agency’s (EPA) gas protocol, the gas is made by specialty gas companies that follow an EPA document to blend and analyze individual mixtures using NIST guidelines for their certification. Once the thermal check is verified as effective, a final programming step is taken within the analyzer and the chamber’s computer. After the electronics have finalized the programming, calibration technicians run a verification check. This doublechecks that the analyzer is reading gases correctly and that the programming was performed successfully. This step basically duplicates all the prior actions to determine if the unit sustains its readings. At the QED calibration lab, technicians conduct more than 200 annual and semi-annual calibrations a month, and program the motherboards and port control protocol (PCP) inside the equipment to proper specifications. First and foremost, always follow all manufacturers’ guidelines and recommendations concerning equipment use and maintenance. Seek out and use preventative maintenance kits and protective filters, which live inside the case and protect the equipment from damage. One example is water trap filters, which can protect against condensation in the line or at sites with a high-water table. This condensation can have a negative effect on equipment accuracy. Water trap filters that provide built-in gas moisture removal are also widely used in medical device analyzers, including those designed to monitor CO2for verification of incubators in in-vitro fertilization, medical research, and pharmaceutical applications. The use of filters is essential for ensuring data accuracy. Conduct field calibration at least once a day. This ensures the analyzer is reading precisely for the specific application and verifies the unit is reading correctly each time with the factory settings. The field calibration is done using a kit containing a small, hand-held 24-inch gas canister and a regulator inside a special carry case. Users hook up their equipment to the canister with the special concentrated blend that uses the gas ratio specific to their application. One of the most widely used is a kit for landfills, in which the gas is 50 per cent methane and 35 per cent CO2. Gas analyzers play a key role in important processes. Maintaining timely and proper calibration ensures they can contribute to the fullest extent and avoid wasted time and effort.